Police have sealed off a road on a Sheffield estate this morning following concerns for the safety of a man. A number of homes are within the cordon in Lupton Road, Lowedges, with police officers standing guard at both ends. Residents claim police officers started to arrive at the scene between 7.15am and 8.20am. A number of officers are working within the cordon, with activity appearing to centre around one house. There are a number of officers surrounding the property. Officers extended the police cordon by around 20 metres at around 9.30am, using police tape to keep passers-by away from the scene. 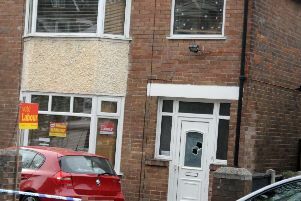 A South Yorkshire Police spokeswoman said: " Police are currently at a property in Lupton Road, Lowedges, following concerns for the safety of a man inside. "While there is a cordon in place, there is not believed to be any risk to the wider public at this time and the priority for officers is ensuring the safety of the man inside the address."